Thanks to enviable starting pitching depth, the Washington Nationals are not likely to pursue a trade in the wake of Stephen Strasburg‘s trip to the 15-day disabled list. Strasburg, who has logged a gaudy 5.16 ERA and a .289 batting average against in 13 starts this season, departed his Fourth of July outing against San Francisco after 56 pitches. He induced a ground out from Buster Posey and then grabbed at his left side. MRI results on Sunday revealed a right oblique strain, prompting his second stint on the DL this year. He was placed their with neck muscle tightness on May 30 and missed close to a month. The 26-year-old right-hander appeared to be pitching better after returning from the DL on June 23. He blanked Atlanta over five innings with six strikeouts and one walk, earning a win. The 26-year-old right-hander followed that by limiting Philadelphia to two runs and four hits with nine strikeouts and one walk in seven innings, getting the win. He was cruising through Saturday’s appearance, allowing no runs and one hit to accompany three strikeouts and two walks, until the injury occurred. 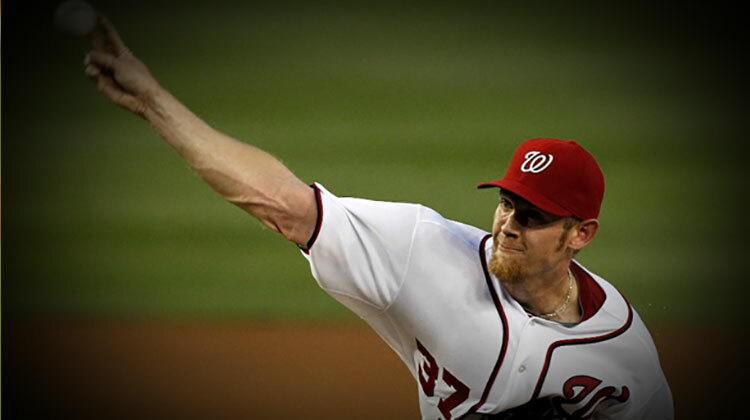 Max Scherzer, Jordan Zimmermann, Gio Gonzalez and Doug Fister occupy the other four rotation spots. Tanner Roark, the versatile 28-year-old right-hander who is 4-3 with a 4.33 ERA over 21 appearances (including six starts), will fill in for Strasburg. The Nationals also have 22-year-old right-hander Joe Ross, who is 2-1 with a 2.66 ERA in three starts this year, as an additional rotation piece. Washington is 46-36 and owns a 4.5-game lead over the second place New York Mets in the National League East.